I mean, they’re clearly focused on the systems right now, which are very much targeted at first-time modular users, and which require a bunch of boring modules. I think it’s just an opportunity to also make the modules generally available that didn’t make sense to ignore. If this is a money-maker for them, I’m sure more interesting modules will come. Frankly if it speaks 1v/8 (or configurable for the scaling), the more the merrier. So good looking. But… disposable battery powered? Seems inconvenient (and wasteful) in the long run. Or am I missing something? Does it look like you could power it any other way? Can’t you use rechargeable AA batteries? glad to see more cheap modular stuff not made by behringer!! At first I was super excited, but after checking prices and seeing that most of the modules are typical subtractive stuff my enthusiasm dwindled a little. But I am interested in keyboard (because of custom scaling) and maybe a speaker (probably depends how powerful it is, but putting a speaker into modular case might make it feel even more as a standalone instrument). Hopefully TE will release in the future more crazy modules like CV controlled punch in effects etc. Does it look like you could power it any other way? I have to admit that this is pretty awesome. Teenage Engineering have beat Behringer to market, and have done it with out ripping anything off (at least blatantly) in the process. Yes, they’ve only appeared to rip off excellent design sensibility (Braun/Rams), and for that I shall reward them with hard earned dollar bills. Of all things, the keyboard is the most interesting! Anyone else notice that the patch cables are TRS? Given that the knobs are Lego …I could use my kid’s vast collection of Lego to control things…instead of CV? 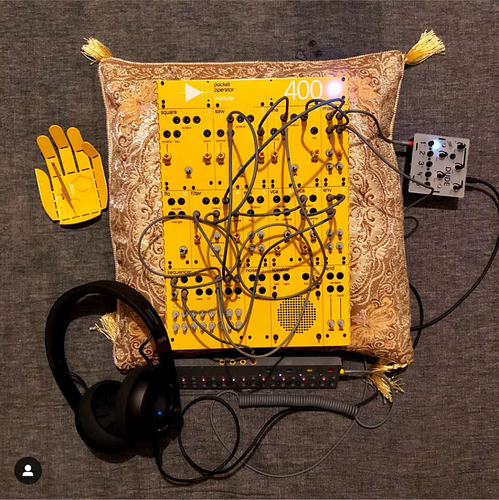 Is this the dawn of a physical interface control pattern in modular? OF FIDDLY RUBBER BANDS AND GEARS AND STUFF? CV is out, Technics and Mindstorms - way in. The keyboard is cool and useful – being able to dial in the frequency of each individual key is great and will be a nice controller to use with many racks. As for the synth modules… very underwhelming and adds nothing. Oh that’s great. Maybe there’s a way with the keyboard too (like to some others here, that’s the one that looked the funnest to me most first). Until we hear otherwise, my assumption is that the majority of the jacks are mono despite TRS but they wanted some jacks to be capable of PO sync. So they standardized to TRS.